PDF version. Updates will be posted here. What is a scalable solver? A scalable solver can solve N equations in N unknowns with O(N) work. Is it time to look at your solver? Is your solver using significantly more time or memory than the physics? Is your time stepping limited by stability? Are you putting loops around the analysis? Schedule and content are flexible, let me know if you have requests. Have a look at my AGU poster for a bit of a preview. Kelley. Solving nonlinear equations with Newton's method, 2003. Benzi, Golub, Liesen. Numerical solution of saddle point problems, Acta Numerica, 2005. Elman et. al. A taxonomy and comparison of parallel block multi-level preconditioners for the incompressible Navier-Stokes equations, JCP, 2008. Knoll, Keyes. 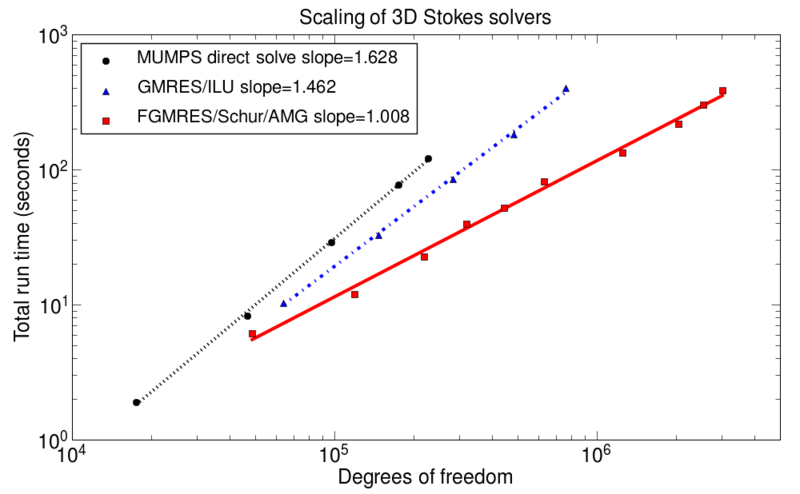 Jacobian-free Newton-Krylov methods: a survey of approaches and applications, JCP, 2004. The Knoll and Keyes paper is especially recommended. Please email me if you need a copy of these or anything else.